Previously reported was that Amazon.com had posted images of the Halo 3: Collectors Edition on their site, and it showed that two game discs were being used to hold all of Halo 3's content. Some said the campaign was so incredibly massive that it needed two discs while others said one was for multiplayer and the other for single-player. All those rumors are false! 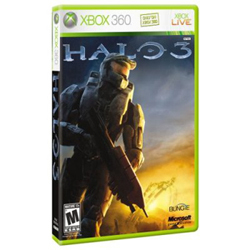 Includes Halo 3 for Xbox 360 and a manual. And obviously hours, days, weeks and months of hi-intensity Halo joy. Hi-Def Halo: Bungie’s graphics and audio engineers have created a simple to use, Halo-themed calibration tool to make the most of your Home Theater experience. Art Attack: Exclusive Halo 3 Gamer Pics and Dashboard theme, a vast gallery of concept and production art (complete with musical accompaniment) and a fully playable version of a classic Halo-themed mini-game. Featurettes: A series of short films covering a range of subjects, from making your Network play nice with Multiplayer, to the challenges of building the biggest Halo ever. Fully sculpted Spartan helmet: The most collectible piece of Halo merchandise ever conceived. An accurate model of the Spartan Mjolnir Mark VI helmet. Storyboard Collection: Exclusive selection of storyboard art from Halo 3's cinematics. Halo Cinematics Reloaded – completely remastered, hi-res versions of the Halo and Halo 2 cinematics with 5.1 audio and complete with optional “Director’s Commentary” track featuring Marty O’Donnell, Joseph Staten and Jason Jones. Bestiarum – an expanded digital guide to the creatures, cultures and worlds of Halo 3, with art and assets exclusive to this interactive edition. The Cortana Chronicles – Jen Taylor, the voice of Cortana, takes us on a tour of the worldwide Halo fan community ,where she meets Halo fanatics from near and far, obscure and famous alike. Plus: All-new, exclusive Machinima episodes from Red Vs. Blue and This Spartan Life and a novel “mockumentary” voiced by Sgt. Johnson himself, David Scully.